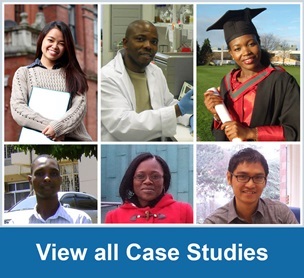 Teboho was supported by Irish Aid to study for an MSc in Applied Science (Food Microbiology) at University College Cork in 2011-12. There are lots of things I’m gaining from studying in Ireland, meeting people from different backgrounds – from the Netherlands, America, Ireland. We always combine our inputs together and, back home, I’ll now be able to draw on aspects of how other countries deal with things. Before coming to study in Ireland, I was a head of department working for the Ministry of Health in a section of laboratory services where my job was mainly in diagnostics, getting samples from patients, analysing them and giving feedback to doctors. In Lesotho, public health services and diagnostics have been combined together until now, but before I came here the Minister was in the process of building a separate laboratory for public health services to focus on things like food-borne illnesses and public safety, preventing problems with good hygiene. I chose the Food Microbiology course at UCC to get skills to help improve the public health services that I’ll be working in on my return. Food Microbiology encompasses the study of microorganisms which have both beneficial and deleterious effects on the quality and safety of raw and processed foods, so the course is concerned with approaches to monitoring food-borne illnesses and infections, putting mechanisms in place to prevent problems and also learning about ‘good bacteria’ that we can culture and use in a positive way. Healthy people who eat contaminated food may vomit or get diarrhoea for one or two days and recover, but in Lesotho, where many people have HIV or a chronic illness, it is more serious and we may not trace a person having diarrhoea back to what they ate because they’re already ill. So we’re losing the train and there are some illnesses not reported where we need to make sure they are. Also, food borne illnesses can have very long term consequences for anyone, so I want raise the awareness levels. There are some gaps we need to fix in the way people are handling food in my country right now and I think the policies are not clear. I would hope to advise the Ministry of Health on disease control and how we can put in place policies like HACCP for people handling food. My course is really fantastic and I’ve learned a lot about food safety, food engineering, food hygiene and prevention of food-borne disease. My mentality on approaching things has changed, too, and I want to be more involved in advocacy for policy when I go back. When I applied for the scholarship, I felt I needed to progress on my studies but government funding was closed. Fortunately, Irish Aid gave me an opportunity and I think I can do something with the level I’ve now reached. I really want to give back and put that knowledge in place. I have recently accepted a job offer at the National University of Lesotho in June this year. My job entails lecturing students in Food Microbiology courses and engaging in research studies concerning food and nutrition. I am also liaising with different stakeholders in making policies for the country. Currently I am working on establishing food safety standards with the Ministry of Trade, Agriculture and Public Health.